A-HOTEL.com - Luxury and cheap accommodation in Lukhovka, Russia. Prices and hotel, apartment booking in Lukhovka and surrounding. Solnechnaya Mordoviya provides accommodation located in Saransk, 9 km from Mordovia Arena and 5 km from Saransk Botanical Garden. There is a fully equipped shared bathroom with shower and free toiletries. Situated in Saransk, Apartament on Prospekt Rossiyskoy Armii, 18 features free WiFi and units fitted with a kitchen. Each unit is fully fitted with a washing machine, a cable flat-screen TV, a sofa and wardrobe. Barbecue facilities and a garden are offered at Holiday Home on Voroshilova, which is located in Saransk, 3.3 km away from Mordovia Arena and 1. АППАРТАМЕНТЫ-СТУДИЯ is an accommodation set in Saransk, 5 km from Mordovia Arena and 3.8 km from Saransk Botanical Garden. Featuring city views, Апартаменты Супер Люкс is located in Saransk, around 6 km from Mordovia Arena. This apartment features air-conditioned accommodation with free WiFi. Situated in Saransk, 6 km from Mordovia Arena and 3.6 km from Saransk Botanical Garden, Apartments near Mordovia arena offers free WiFi. Hostel Klyuch features rooms in Saransk. The property is around 3. Set 3 km from Mordovia Arena, Гостиный дом "Райское местечко" provides accommodation and free WiFi in Saransk. There is also a kitchen in some of the units equipped with an oven, a microwave, and a fridge. 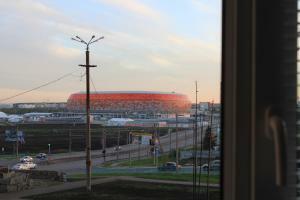 Featuring city views, Apartments near the stadium of Mardovia Arena provides accommodation with a balcony and a kettle, around 3 km from Mordovia Arena. This property is 1. Offering free WiFi and city views, Apartment at 124 Volgogradskaya is an accommodation located in Saransk. The property is 4. Apartment on Mordovskaya 22 features a balcony and is set in Saransk, within just less than 1 km of Pushkin Park and a 20-minute walk of Sobornaya Square. This property is 2. Featuring a shared lounge, Green hostel is situated in Saransk and is 2.6 km from Mordovia Arena. Located in Saransk, 2.7 km from Mordovia Arena, Apartment Mordovskaya 3 features air-conditioned accommodation with a balcony and free WiFi. Set in Saransk, Apartment Volgogradskaya provides accommodation with a balcony and free WiFi. The property is 2. Situated in Saransk, just 2.8 km from Mordovia Arena, Apartment on Volgogradskaya provides accommodation with a shared lounge and free WiFi. Волгоградская улица, 60/3 offers accommodation in Saransk, 2.8 km from Mordovia Arena. Апартаменты "De Luxe" offers accommodation in Saransk, 2.8 km from Mordovia Arena. Offering free WiFi and city views, Кирова 33А is an accommodation located in Saransk, just 500 metres from Pushkin Park and 1.5 km from Sobornaya Square. Rosemary Inn is located in Saransk and features a shared lounge. 3 km from Mordovia Arena, the property is also 1. Set 3.6 km from Mordovia Arena and 4 km from Sobornaya Square, Апартаменты "Бизнес-2" provides accommodation situated in Saransk.